Over the course of my stay in Donetsk I saw nothing that was markedly different from what is publicly known. Up close, however, many things certainly appeared completely different in detail. When the Slavyansk Brigade came to Donetsk, almost immediately the question of cooperation among the units gathered in the city was raised. Two paths were evident: the creation of a centralized hierarchical command, or the establishment of a kind of 'Shura'—a council of commanders. The first option was fraught with the danger of a civil war within a civil war; the second one immediately made the process of creating an army a long-term affair. The commanders chose the second path, especially since I did not observe any of them to have any particular disagreements with Strelkov. The question of the Vostok Battalion and Khodakovskiy was treated separately, although, as I understand it, a solution to this issue was also found. At this moment in time, the Militia of Donetsk is comprised of three large brigades: the Slavyansk Brigade and the Oplot and Vostok Battalions. Apart from these, there are several self-sufficient militarized structures, such as police units. Among them all there is complete coordination and cooperation. 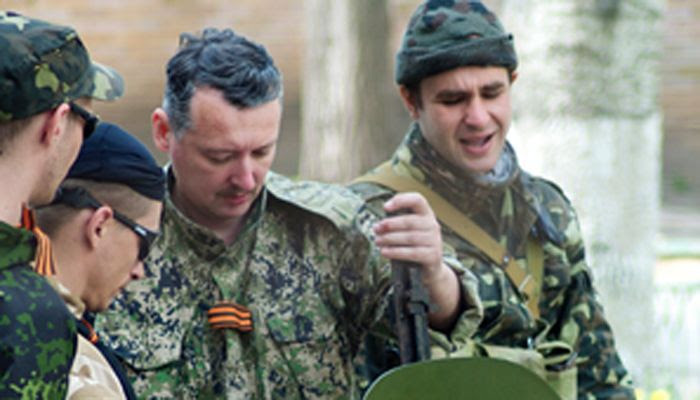 The representatives of the Vostok Battalion categorically abstain from attending joint meetings; however, in spite of this, Strelkov has a mechanism for coordinating actions even with them—right in front of me, literally five minutes after getting disinformation concerning an attack on Yasinovataya by ten tanks [of the Ukrainian Army], Strelkov received information from Vostok that there were not ten, but three tanks, and, even so, that one of them was burned out, while the rest had retreated. Apart from the Donetsk military formations, there is an almost entirely self-sufficient unit commanded by Bezler; however, here also there are no problems of cooperation or coordination. The system works quite effectively, even though certain problems naturally do exist. The independence of the Oplot and Vostok Battalions is due, first and foremost, to their independent supply channels. These units are practically independent from Strelkov also in this aspect; however, even in this regard, when the need arises, they manœuvre [and share] their available resources in the interest of their common struggle—all without any problems. Overall, the process of building the DPR [Donetsk People's Republic] Army is following a path that is fairly traditional in similar situations. It can be said that, at this stage, the most operationally capable management structure has been found. Nonetheless, this structure has its weak link. The council of commanders recognizes Strelkov as their Commander-in-Chief; moreover, I noticed that this acceptance is unconditional. Although he is merely a first among equals, his role in the organization is extraordinarily important. And that is why the persistent efforts of the Moscow Nazis [Note: reference to Kurginyan and his sectarians, whose media attacks on Strelkov benefit the Ukrainian Junta] appear exceedingly dangerous from all points of view. In view of the chosen organizational form of command, there is no one else that the commanders will agree to subordinate to. It may well be that the well-known political analyst [Note: Kurginyan] and his pro-Nazi sect nourish the hope that, by removing Strelkov and installing at the head of the Militia a commander controlled by them, following victory they will gain the right to construct a simulacrum of themselves in Novorossiya. The problem is that there is no visible path to victory in such a scenario—the Militia will never subordinate itself to anyone else. The breakdown of the control structure would be inevitable, and then, in order to restore at least some control, war would have to be waged between former allies. 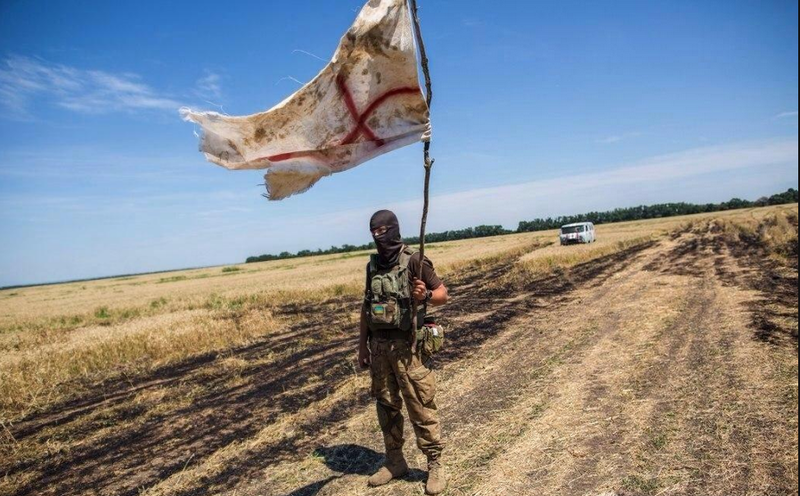 In this case, the result of such infighting looks quite problematic for the Moscow Nazis—it is the Slavyansk Brigade that is the most powerful force in the Militia. Nevertheless, all of this still does not change the fact that [Kurginyan’s] sect operates strictly in the interests of Kiev. More likely than not, the Moscow oligarchs that sent the fulminating political analyst to Donetsk see the situation in the correct light and hope, by removing Strelkov, finally to bury the idea of Novorossiya—followed by a coup in Moscow. It is difficult to tell whether the 'Guru of Treason' understands this. It may be that he is being used without his knowledge [Gleb: Yes, and my right foot is green, while the left one changes colour daily...]. One way or another—but any attempts to create problems for the Militia by undermining the current command structure will at this stage lead to a defeat. Essentially, this is the main thing that I finally was convinced of in Donetsk. It is true that an army built on the basis of oral agreements is not, strictly speaking, an army. And the need to establish a fully-fledged command structure, which is not dependent on the identity of the Commmander-in-Chief, will inevitably arise. At this time, however, there are not the slightest prerequisites for this to happen. The value of the DPR’s political component today is at best zero, if not negative. The construction of a fully-fledged political and economic management system has, so far, been unsuccessful. The constant shuffling of premiers and deputy premiers is the best evidence of this fact. This structure is only beginning to be formed; appropriate candidates are being identified, base principles of the DPR’s political programme are being formulated. And that is precisely why even an army based on oral agreement is the only structure that provides the necessary stability to the DPR. Undermining this army by discrediting its Commander-in-Chief and the targeted attacks on him by corrupt politicians and their insane sectarians represent deliberate attempts to destroy the entire idea of the Donbass uprising. 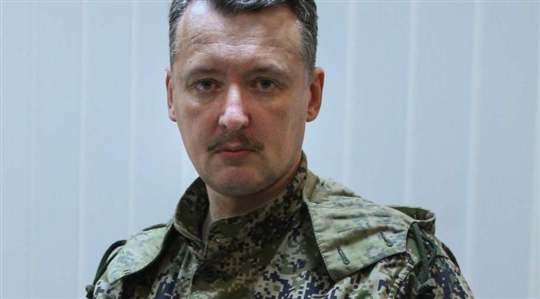 At this time, there is no other way to characterize or understand these assaults on Strelkov. Kurginyan: Let him tell me why he surrendered the city! 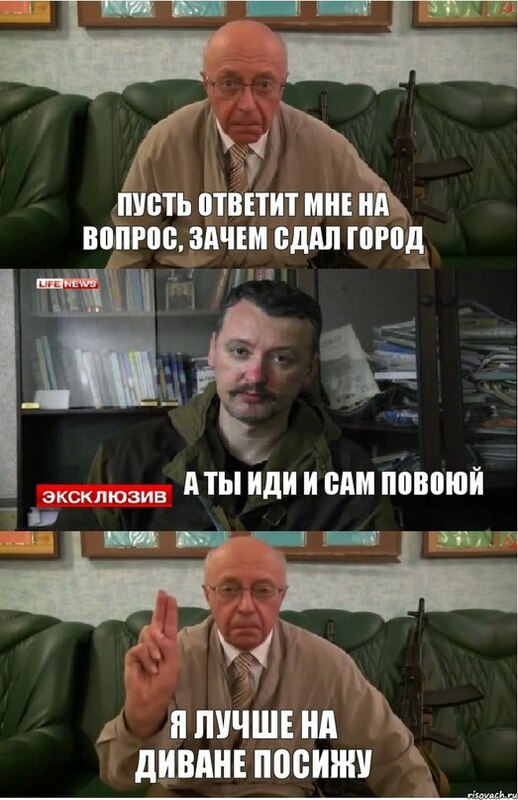 Strelkov: Why don't you go and fight yourself? Kurginyan: I better stay here, on the couch. I say this not because I am acquainted with him or because I experience feelings of friendship for him—in this case, all such considerations are absolutely irrelevant. There is an entirely objective situation that dictates its own rules of engagement. Essentially, I returned to Moscow now, and not later, because the danger posed by these attacks is currently exceedingly high. Their intensity is increasing, and there are signs of this not only in the public domain. I did not come alone, and we will try to convey this message to the highest of offices and to the widest possible audience. At the moment, this is what is most important. At the same time, the military prospects of the DPR at this time I would characterize as clearly 'non-zero' [Note: i.e. positive]. Kiev does not appear to have any strategy to suppress the uprising that would generate results in the short term. A war of attrition would be ruinous for Novorossiya—particularly in a context where Russian aid remains largely symbolic in nature and manifests itself primarily as humanitarian and private deliveries. Even so, Kiev also does not have a wide berth for manœuvre in such a field—its situation appears no longer just critical, but catastrophic. 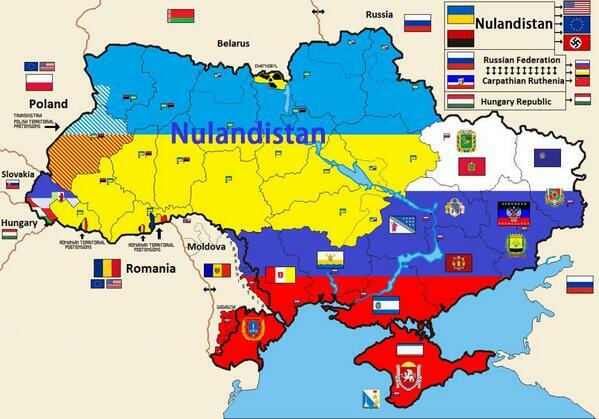 The solution may become a coup and the establishment of an openly Nazi military dictatorship, which would then crush any and all unrest in the territory of Ukraine, enabling it to continue the war in the previous format even in the context of a complete collapse. Whether or not the Europeans would risk giving the go-ahead for the creation of such a state is a difficult question to answer. So far, Poroshenko’s regime, despite all its pro-Nazi orientation, still appears to the West to be fairly controllable. 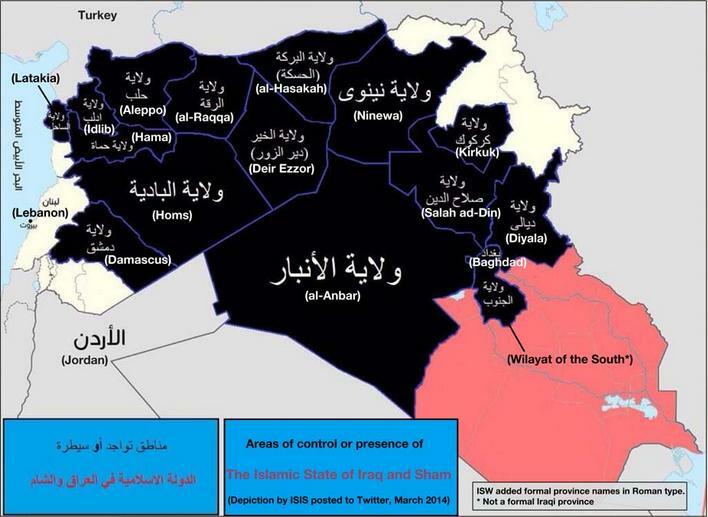 However, the creation of a Banderite 'Caliphate' in the middle of Europe could completely change the situation on the continent—just as the situation in the Middle East was transformed by the creation of the ISIS 'Caliphate', which completely unshackled itself from its creators. At the same time, the United States may well go along with this course of events—it does not scare them in the least. And that is why the likelihood of a coup in Kiev and the coming to power of radicals is quite high.